Ecwid seamlessly integrates with your current Wix website — your design is preserved and no programming is needed. Add your store to as many sites as you want and manage it from one place. Any changes you make are mirrored instantly across all your sites. Sell on your Wix ecommerce site, mobile phones, social sites and marketplaces like Google Shopping, eBay and Shopping.com. Ecwid integrates with social networks including Facebook and Tumblr. Your Ecwid store looks perfect on any smartphone and adapts to your customer’s screen. You’ve designed a stunning website, now add powerful e-commerce capability to Wix with Ecwid’s easy-to-install, full-featured and free Wix shopping cart. 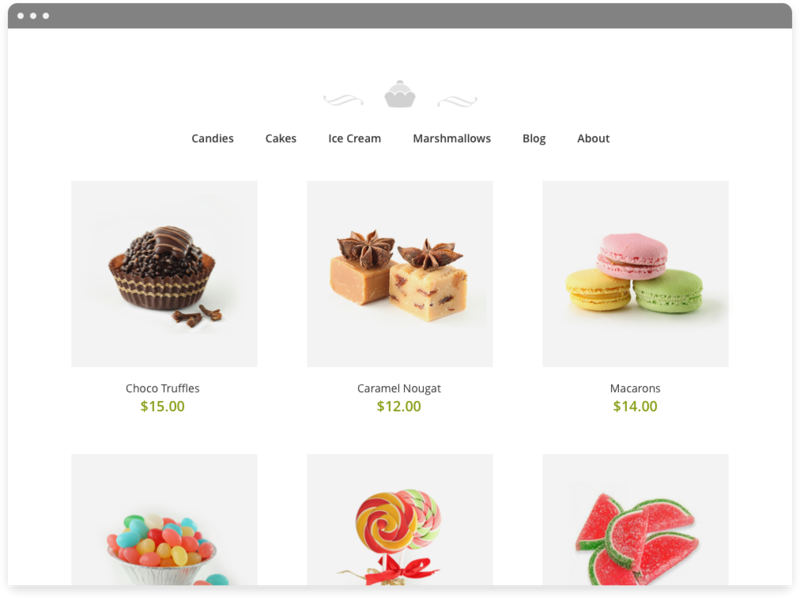 Ecwid’s Wix store module seamlessly integrates into your current website, offering a lightning-fast, customizable Wix e-commerce solution that requires no setup charges or transaction fees. With a few short steps you can begin selling products through your website by installing Ecwid’s Wix online store application from the Wix App Market or using simple widget codes. Instantly boost your Wix e-commerce potential and take full control over your Wix online store with Ecwid. Ecwid’s Wix shopping cart offers a wide array of useful features that make shopping easier for your customers and product management simpler for you without any limitations of the native Wix ecommerce solution. Your Wix online store will operate quickly and smoothly with our lightning fast AJAX interface. You’ll also be able to easily manage your inventory and promotions, choose from a variety of payment, tax, and shipping options. You can also customize your store’s appearance, utilize over 50 built-in storefront language translations, offer promotions and more, all while keeping your customers on your website. Ecwid also uniquely offers you the ability to seamlessly synchronize your Wix online store across your Facebook page, multiple websites and matching mobile site, all of which you can easily manage from one control panel. Installing Ecwid’s Wix e-commerce app requires only a few short and simple steps. After signing up for a free Ecwid account, log in to your Wix HTML editor, visit the App Market page, and locate Ecwid’s Wix shopping cart application. When you add Ecwid’s free Wix online store to your site, an online store page will automatically be created and you can add and customize your Wix online store from there. Once you have registered your Ecwid account, you can begin replacing the demo products used as placeholders on your page with your own products and descriptions. Now you can begin to customize the appearance and functions of your Wix shopping cart, and manage all of Ecwid’s comprehensive features from one control panel. Ecwid gives you complete control over your premium Wix e-commerce experience, allowing you to grow your business and manage your website the way you want. Ecwid’s Wix shopping cart will always provide a feature-rich, free version, but we also offer a range of paid plans offering additional premium features. Your Wix online store by Ecwid will also constantly receive seamless updates and improvements that will be automatically integrated into your Ecwid experience. Ecwid’s revolutionary Wix e-commerce app can be set up in a matter of minutes, easily managed, and smoothly integrated into your existing Wix website.